Main Street Gazette: Walking right down the middle of Main Street, U.S.A. 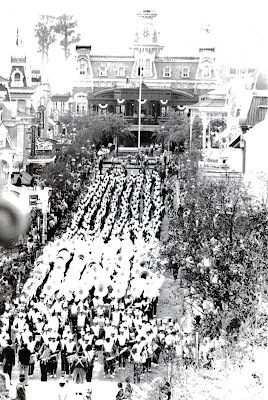 Walking right down the middle of Main Street, U.S.A.
Walt Disney World and the Magic Kingdom opened on October 1, 1971, yet the park and resort area were not dedicated until October 25 of that same year. While Roy Disney’s dedication is the moment most remembered from that day, the band surely left an impression upon all who saw it. The band was composed of 1,076 performers, including 210 trumpets, 144 clarinets, 276 trombones, and the world’s largest bass drum (in 1971). In fact, the group was so large that rehearsals, like the one seen above, were done in smaller sections. When they played together for the first time during the dedication, it was the largest band to ever march. At the head of this massive ensemble was composer and conductor Meredith Wilson, best known for his work on The Music Man, who conducted the band from a gazebo that rolled down Main Street, U.S.A. While he was the primary conductor, there were seven spot conductors who kept the band playing together in time. The band, though not the 1076 piece version, was an indelible part of the park going experience for many years. So much so that in 1972 Vista released the record, Walt Disney World Band. The 19 track album featured park favorites, such as Grim Grinning Ghosts and It’s a Small World, and terrific takes on standards, including America the Beautiful and Seventy-Six Trombones. While the band may not be as ever-present in the Magic Kingdom as it once was, it doesn’t mean it has evaporated entirely. A 12-piece ensemble can still be found meandering and performing in turn-of-the-century Main Street. Known as the Main Street Philharmonic, the band can be found most afternoons in the Magic Kingdom, so be sure to keep your ear tuned for the striking up of the band! Can you still get the 1972 record on something like an Itunes or even on CD? Ben, the CD version of the album is available in some places, the best bet would be Amazon. I have a digital copy from iTunes and, I believe, Amazon has the digital copy as well. It is an awesome album!